As expansion packs go, I think it's safe to say that Shadows of Undrentide surpassed most of our expectations. Yes, we expected a new narrative and new monsters. Of course we figured we'd see new feats and classes. But BioWare pushed the envelope a little by giving us control of our henchmen's inventories and training, not to mention making it even easier for us to make mods by including new toolset wizards. Even so, the more curmudgeonly of us (Ok, I) groused that the story was too linear and not epic enough. We also felt we should have been able to pass level 20. Why should we have to sacrifice higher levels to get the benefits of a prestige class, we wondered? Well, the good folks at BioWare heard our cries and responded with Hordes of the Underdark, an expansion pack with so many bells and whistles that I still haven't experienced them all as of this writing. 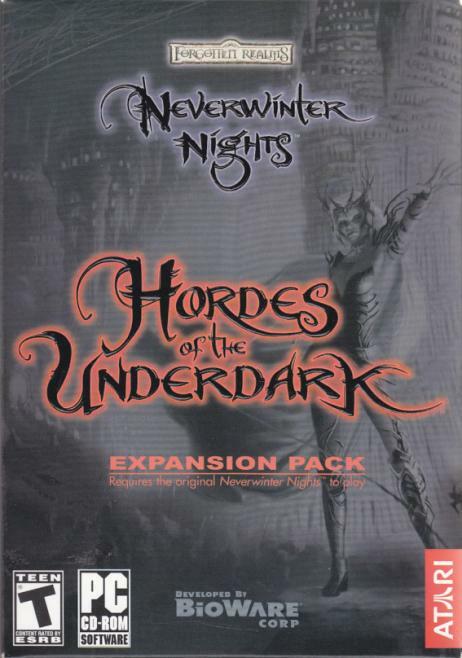 In almost every aspect, Hordes of the Underdark brings a change to the Neverwinter Nights experience that's expected, then goes one step further. First of all, setting the story in the Underdark obviously meant new tilesets for the Drow, Illithid, and Beholder communities and new monster models for their denizens. You could already give your character the skin and hair color of a Drow, but the designers went ahead and upgraded the clothing models so they could preserve the Drow leather fetish, even going so far as to include new texture packs for robes. The tilesets, models, and robes all look great and you can use them all in your mods. In addition to cosmetics, we knew that gameplay would be enhanced by the ability to play as new prestige classes. After the relatively tame prestige classes in Shadows, I was astounded by the imagination put into the prestige class offerings in Hordes. Instead of getting more bonuses in the feats already present, several of the new classes come with completely new abilities. It seems that the designers really want players to branch out and try other classes, but they know that to get someone who doesn't like playing a sorcerer to try it, they need to offer a way to mitigate the sorcerer's weaknesses. So, in HotU, you can have your sorcerer become a red dragon disciple, giving him better defense (dragon skin increases natural AC), access to the dragon breath weapon, and eventually even wings. The incentive for playing as a druid may even be better than the latter, since an epic shifter (a prestige class only available to druids) can eventually polymorph entirely into a dragon. On the subject of red dragon disciples, I have to switch gears a bit here and talk about the enhancements given to a familiar NPC from Shadows of Undrentide. I'm sure that most gamers either love or hate the little guy known as Deekin, and those that fall into the former category will be very excited about his expanded role. Not only has Deekin become a high level bard, he's also become a red dragon disciple, allowing him to hold his own in most fights. This may not be enough incentive to keep him around for those players that find his character or voice set to be annoying, since he has random interactions almost constantly. But even the most anti-Deekin player should not overlook his impressive lore abilities and the efficacy of his bard song. I have to admit that Deekin grew on me, partly because the designers took greater care to make sure your henchman is someone you want hanging around. When I went through both Neverwinter Nights and Shadows of Undrentide, I basically brought henchmen along to make up for deficiencies. Tomi Undergallows was funny, and useful for disabling traps, but if he died I didn't feel any strong urge to immediately get him back. I felt that the henchmen in Hordes, on the other hand, really helped to flesh out the story and I found myself reviving Nathyrra just because I wanted to know what would happen to her when the story was over. The story in Hordes is much more fleshed out than the one in Shadows, as well. You start out as the hero of that story, having just returned to Toril from an extended jaunt on the Plane of Shadow to find that the city of Waterdeep is under attack by creatures from the Underdark. The keeper of an inn that sits upon the famous dungeon of Undermountain has called all adventurers to come help him plug the leak that's allowing all the Drow and other denizens to come through. You, of course, respond (as do many of the henchmen from the two earlier games) to stop the Drow empress (the Valsharess) from leading her armies to conquer the surface world. Thankfully, there are three distinct acts to the story, and the obstacles between you and your goals within them don't feel like they were thrown in (as the desert interlude and the golem hunt in Shadows seemed to me). Even though the first chapter is a pure dungeon hack, it seems to make sense that the creatures of the Underdark haven't come to the surface before because they weren't able to hack the huge dungeon. The third act, while drastically removing you from the environs of the first two, makes sense as well, and reinvigorates you with puzzles, creatures, and item functionalities that you haven't seen in the first two acts. So the game isn't just about dungeon hacking with a new set of tricks up your sleeve, and it's also not just about experiencing a new (and much better written) story with the same old engine.